Peel off all labels from your bottles, and scrub glue off completely with a rough sponge. Decorate your bottles by wrapping them in rope or twine, and scoring with wood glue. (optional) Fill the bottle with some pebbles or small marbles (so you don’t have to use as much torch fuel!). Pour in the fuel a few inches from the top. A small brass coupling works well to keep your wick in place. Depending on the thickness, a ½–¾ coupling fits a wick perfectly. Push it through about 1½ inches. Place it in the bottle, and let it soak up the fuel for about 20 minutes. 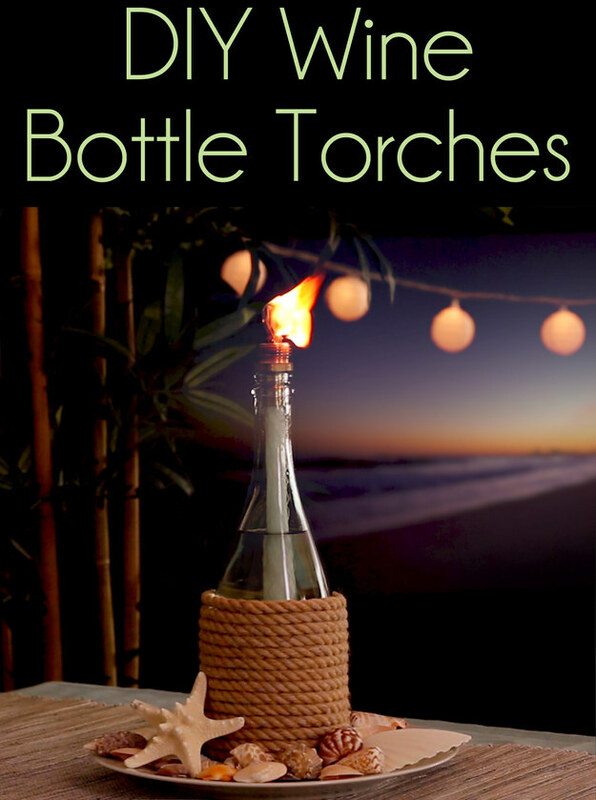 Set your bottle torch outside in an uncovered area, and light it up! These are great for outdoor parties, mosquito repellent, or table decor. Enjoy your repurposed bottle torches!